For more than 15 years DO-IT has been working together with a local Indian branch. Poppe Braam was involved in the start-up of an organic division of an agricultural company. India has a lot of potential for organic in several regions. In Uttar Pradesh, far away from polluted soil, at the foot of the Himalaya hills there is a group of farmers growing the original breed of basmati rice. Complete villages of farmers have switched to organic under the guidance of agricultural engineers and with proper certification. A long and steady relationship has been established. 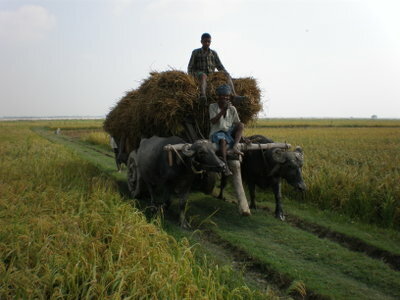 Other organic crops from the Indian project are sesame seeds, linseed and amaranth. Now the farmers fully understand the organic philosophy, not only growing organic but also embracing the holistic aspects. As part of the project there are initiatives to improve living conditions by getting education for the children, better sanitation and work for women to make them more independent. For example, the donation of sewing machines for clothes and embroidery and workshops on how to set up their own business. By building infrastructure, education, health, livelihood, rural development, water conservation and environmental protection can be developed in the rural areas of the farmer villages. The factories in the same project are equipped with utensils for a safe and hygienic working environment. Now the sons and daughters are the next generation, growing up with organic agriculture and production, ready for the future.